The Vampyre and Other Tales of the Macabre on TheBookSeekers. John Polidori's classic tale The Vampyre(1819), was a product of the same ghost-story competition that produced Mary Shelley'sFrankenstein. The present volume selects thirteen other tales of mystery and the macabre, including the works of James Hogg, J.S. LeFanu, Letitia Landon, Edward Bulwer, and William Carelton. The introduction surveys the genesis and influence of The Vampyre and its central themes and techniques, while the Appendices contain material closely associated with its composition and publication, including Lord Byron's prose fragment Augustus Darvell. About the Series:For over 100 yearsOxford World's Classicshas made available the broadest spectrum of literature from around the globe. Each affordable volume reflects Oxford's commitment to scholarship, providing the most accurate text plus a wealth of other valuable features, including expert introductions by leading authorities, voluminous notes to clarify the text, up-to-date bibliographies for further study, and much more. The Vampyre and Other Tales of the Macabre by Robert Morrison and John Polidori has not been rated for age or fabulousness yet on TheBookseekers. There are currently no reviews for this book on this site. Click on the + buttons to include your own ratings! 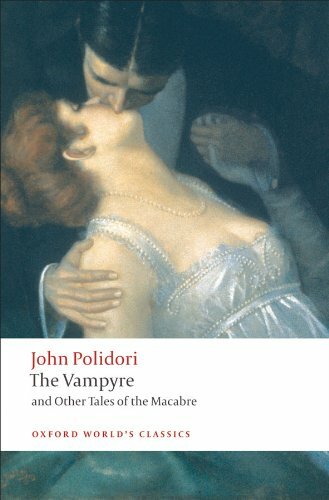 The Vampyre and Other Tales of the Macabre was written by Robert Morrison and John Polidori. It was written for young readers to enjoy.